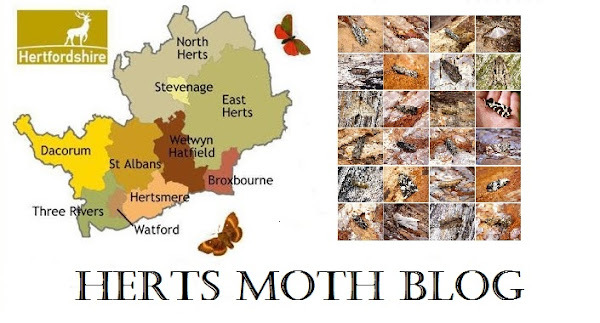 I have been a bit lazy updating my blog as of late, partly due to not being able to photograph the moths that I have been catching as it is too dark in the morning and too dark when I return from work in the evening thus a weekly report is all I can muster at the moment! I ran the trap on Tuesday night and last night. On Tuesday I managed 3 moths of 3 species, and last night I did a little better with 5 moths of 4 species. The highlight being only my second garden record of Acleris hastiana on Tuesday and last night my first Spring record of Dark Chestnut. The Spring Usher was sporting a very similar pattern and colour to an Oak Beauty. I am currently experimenting between using an Actinic and a Mercury Vapor trap, though last night although milder, did see the MV attracting slightly more. I hope to run the trap a few night next week, but although the forecast is quite mild at around 8 degrees daytime, the temperatures will be suffering a bit at night so I will see how it goes. Ben 10.............Lol! (funny, only if you've got kids) Doing very well matey! I trapped a Spring Usher (a first for me) at the weekend which looks very similar to yours. I had to get confirmation of id as I wondered initially about Oak Beauty. :o hehe i'm at 11 now. Good luck tonight guys if you are trapping.